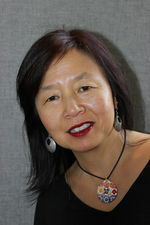 Mimi Kim is Assistant Professor School of Social Work, California State University, Long Beach. Dr. Kim’s research is in the area of social movements and community organizing with an emphasis on domestic violence and sexual assault in communities of color. She is a long-time anti-domestic violence advocate in Asian immigrant and refugee communities and remains active in the promotion of community organizing, community accountability and transformative justice approaches to violence intervention and prevention. Dr. Kim currently teaches social work policy and supervises MSW thesis projects. Mimi Kim of Korea Solidarity Committee spoke at a July 27, 2003 nationally organized peace vigil commemorating the 50th anniversary of the Korean War’s end, UN Plaza, [San Francisco]. In 2007 Mimi Kim was listed on the DataCenter's annual report as a donor to the organization. The Oakland, California based DataCenter is widely regarded as the intellegence wing of the United States Left and has close ties to Cuba. This page was last modified on 6 September 2016, at 03:10.